You're receiving this newsletter because you visited the Tiare Films stand at the Wellington Wedding Show, Manawatu Wedding Expo, or you signed-up at the Tiare Films website. Having trouble viewing this email? View it in your browser. 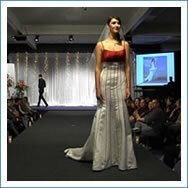 In this issue we recap the 2009 Manawatu Wedding Expo. This is the first time we've had a stand at the Manawatu Wedding Expo. We'd like to thank everyone who attended for making it such an enjoyable event. On the day we talked to couples considering local venues, Samoa, and even a combined wedding-honeymoon cruise ship escape! We also filmed the wedding fashion show for the expo organisers - so watch this space for video highlights. Our wedding DVD packages combine the features that are most-often requested by couples when filming their wedding. For intimate weddings, our Palm package covers the vows and signing of the register. For larger family weddings our Pearl package is often chosen, as it includes covering the reception, toasts and filming any after-dinner entertainment. We're now taking bookings for the 2009/2010 season. It's best to confirm your booking with us at least 6-9 months in advance of your wedding. Popular dates for the Manawatu are 30 Jan, 20 Feb and 27 Feb; with February overall the busiest month for those attending the Manawatu expo. The wedding fashion show was a highlight. There was plenty on display at the expo, from gowns and accessories to stationery and cakes. If you need to track down the details of an exhibitor, then The Manawatu Wedding Expo website provides a handy list of exhibitors, including links to their websites. 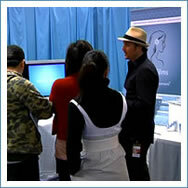 The edited highlight films we screened at the wedding expo can be viewed on our website. Our edited highlight films are a 'condensed' version of the wedding film, included with our Paua and Pearl packages. We also upload the edited highlights film to the web for you to share with family and friends - great for those who can’t attend the ceremony. We’d like to thank Angela & Nick, Veronica & Matthew, and Lianne & Gavin for letting us share their weddings with you. At the Wellington Wedding Show we had the pleasure of meeting Avril Druker and Andrew Michaels who are restoring the historic Highden Manor in Awahuri (about 15 min. from central Palmerston North). After our tour of the venue, we can attest that Highden is well deserving of its reputation, with features that set it apart - matai floors and hand-detailed rimu panelled walls, a generous dance floor and dining area and grounds that provide a wealth of photo opportunities. Renovations are well underway, with the venue opening September - in time for the New Zealand wedding season. As well as filming in New Zealand, we also cover weddings in the Cook Islands - this year we'll be filming in Rarotonga July 18-Sept 27. If you're getting married in the islands, then a DVD is a great way to share your ceremony with friends and family who can't attend. The wedding we filmed in Rarotonga for Lianne and Gavin was held on Motu Koromiri, just off Muri Beach. View our Rarotonga package guide (PDF) . Our special offer of a 10% discount on our popular Pearl package ends 30 June. To arrange a no-obligation wedding DVD consultation, fill out our registration form or contact Justine Flanagan, +64 4 3800 800 / justine@tiarefilms.com.